An Anna's hummingbird weathers the elements in Morro Bay State Park, California. "Little Arnold Schwarzeneggers," hummingbirds are tough—so tough they've evolved a clever way of coping with the cold. As the smallest birds on Earth, hummingbirds may seem frail—so it's not surprising Donovan Nixon asked Weird Animal Question of the Week how they cope with winter. Turns out these airborne jewels are as tough as diamonds. In cold weather, hummingbird bodies enter into an "energy-conservation mode called torpor," according to Oregon State ecologist Adam Hadley. Birds that stay north for the winter experience a nightly "mini-hibernation," in which their 107-degree body temperatures can plummet to 48 degrees. Heart rates also slow during torpor: The blue-throated hummingbird’s heart rate, for instance, drops from 1,260 beats per minute to 50 to 180 beats. Hummingbirds can feed in chilly weather. Hadley has seen an Anna’s hummingbird visit his backyard bird feeder during a 28-degree day. Watch a Sleeping Hummingbird "Snore"
These tiny wonders are also moving farther north—they've been spotted in Vancouver, British Columbia, for instance—due to milder temperatures and an increase in hummingbird-friendly feeders and shrubs, he says. If you’ve ever watched a hummingbird flit around like the golden snitch of Harry Potter fame, its easy to believe they have the highest metabolism of any animals after insects. About 30 percent of their body mass is pectoral muscle, Matt Betts, a forest ecologist at Oregon State, adds via email. “Little flying Arnold Schwarzeneggers!” he says. Hummingbirds show off their aerial skills in both love and war, fighting off rivals and courting mates. Male Anna’s hummingbirds, for instance, “will climb up to 130 feet in the air and do this dive bomb,” during which they'll spread their tail feathers to make a chirping noise before arcing back up to the same height, Hadley says. A marvelous spatuletail hummingbird. The males' plumage are used during mating displays. Some males put on impressive tail-feather displays, like the spatuletail; others, like Costa's and calliope hummingbirds, flare out brightly colored throat gorgets, which change from dull to dazzling in different lights. Speaking of plants, North American hummingbird nests are snug little cups typically woven together out of various types of plant matter, lichen, and spider silk. 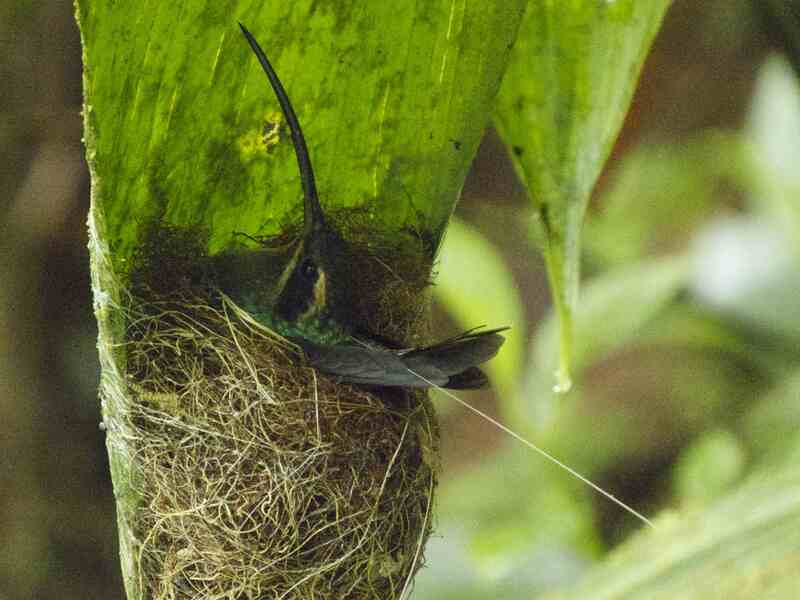 In more tropical areas, Hadley says, hummingbirds nests are more cone-shaped, and made to fit under plant leaves that shield them from rain. By the way, hummingbirds get their name from the sound made by their superfast wingbeats. We thought it was because they have a bad memory for lyrics. Hmmm.